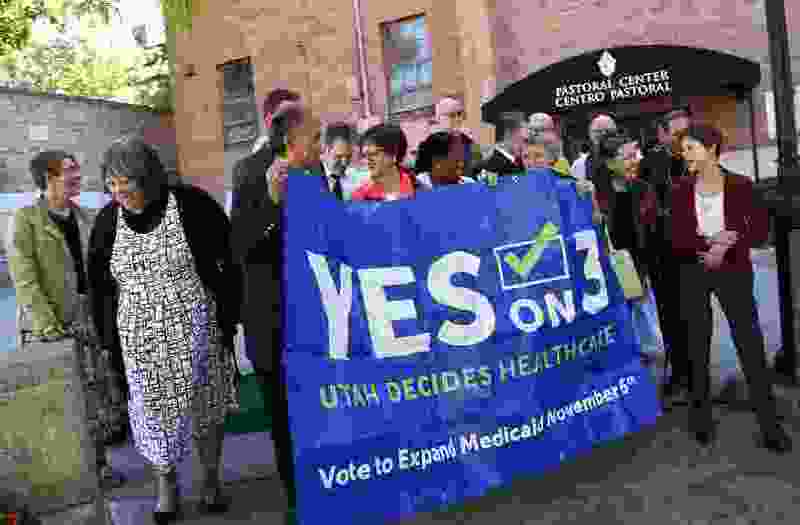 (Francisco Kjolseth | Tribune file photo) Utah faith leaders gather at the Cathedral of the Madeleine in Salt Lake City on Wednesday, Oct. 3, 2018, to make a joint statement in support of Proposition 3, which would expand Medicaid in Utah. Help is on the way for 150,000 low-income Utahns seeking health care coverage after Utah voters approved full Medicaid expansion, according to unofficial election results late Tuesday. Proposition 3 was carrying 55 percent of the vote at press time, with 45 percent opposing the measure. The voters’ endorsement of full Medicaid expansion supersedes and directly rebuffs a partial expansion approved by state lawmakers in March. That plan, sponsored by Rep. Robert Spendlove, R-Sandy, has not yet been approved by the federal government. But no additional government nod is needed for the implementation of Prop 3, because it complies with the requirements of the Affordable Care Act, or Obamacare. Lawmakers, including outgoing House Speaker Greg Hughes, R-Draper, have spoken against full expansion, warning it could overwhelm the state’s budget and require cuts in other spending areas. At least one legislator, Sen. Jake Anderegg, R-Lehi, has stated he intends to repeal Prop 3 even if voters embraced the measure. Spendlove said Tuesday that he would oppose efforts to repeal the initiative. Still, Spendlove added that he continues to worry about the fiscal impact of full Medicaid expansion in Utah. He said other states that have fully expanded the program have seen enrollment and costs exceed projections. Curtis said she was not worried about a potential repeal effort by lawmakers. Prop 3 supporters gathered in Salt Lake City to watch the results, and Curtis said it was rewarding to see community members, including Medicaid patients, cheering the early success. Enacting Prop 3 would include a 0.15 percent sales tax increase to generate roughly $90 million in state revenue. That funding would be combined with $800 million in federal tax revenue already paid by Utahns to cover the cost of new Medicaid enrollees. Final election results will not be released until later this month.